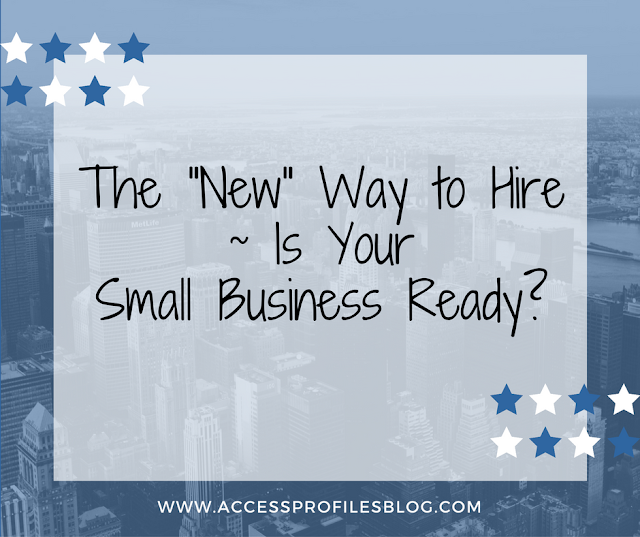 The “New” Way to Hire ~ Is Your Small Business Ready? Not long ago, I saw this quote on a road side billboard, and it got me thinking. to really give the usual way you hire a rest? If you are like most employers, you already have a hiring formula in place. This usually means that you see a need to hire, advertise the position, weed through resumes, narrow it down to a few select applicants to interview, then finish it off by screening your top candidate. It is increasingly possible that you may even automate a small or large part of this process. to get you the best results? is this the only way to hire? While many stand by this method, I think you should consider something different. How about instead of your hiring status quo, you try a “new” way to hire? But, what does giving “traditional hiring practices the day off” really mean? It means moving away from traditional, detached, and scientific hiring decisions and trying a more personal touch. This starts with you treating people not as numbers, or as a statistic, but as individuals. Consider being more broad minded with the resumes you receive. Instead of automatically rejecting those that don’t fit every one of your hiring criteria, widen your scope. Challenge yourself to find a more diverse group of potential hires. Think non-traditionally when picturing who could fill your open position. Would you automatically think of a young graduate? Maybe consider a seasoned professional. Do you think you must have someone with vast experience? Consider a new grad with drive. Making these “outside the box” hires can ultimately lead to a better workforce. One filled with people of various ages, sexes, and races. And, even more importantly, who also have varying opinions, strengths, and skill sets. You can also make some changes when you it comes to the interview. Instead of asking your usual questions, branch out and really take a look at your candidates as people. Ask questions that show “how” they think, what drives them, and where they want to go. Discover the truly unique things these candidates bring to the table. People are much more than what is listed in their resumes. They are the true sum of their parts ~ personalities, interests, and pasts. But taking a chance on someone does not mean you have to go in blindly. give them an informed chance. And that includes knowing what you need to know about your potential new hire. As an employer, you have every right to know the background, skills, and history of your applicant. This means doing your due diligence and not skipping the background check. Employment screening will help you verify that what your applicant said about their past is true ~ a great step in developing trust in your potential new hire. At times, the background check may even result in you being confronted with a candidate that has a less than stellar history. They may have a career path that looks nothing like a straight line. Or had financial troubles that resulted in them filing for bankruptcy. They may even have a criminal record. these candidates from your possible hiring pool, take a step back and re-focus. This is especially true when it comes to a criminal past. Making a blanket decision to never hire anyone with a criminal record is unnecessary and counterproductive. According to EEOC (Equal Employment Opportunity Commission) hiring guidelines, it may even be illegal. More people than ever have a criminal past. Unilaterally dismissing them makes little sense, and could result in you missing out on a talented new hire. And keeping ex-offenders unemployed is simply not the answer to getting them on the right track. 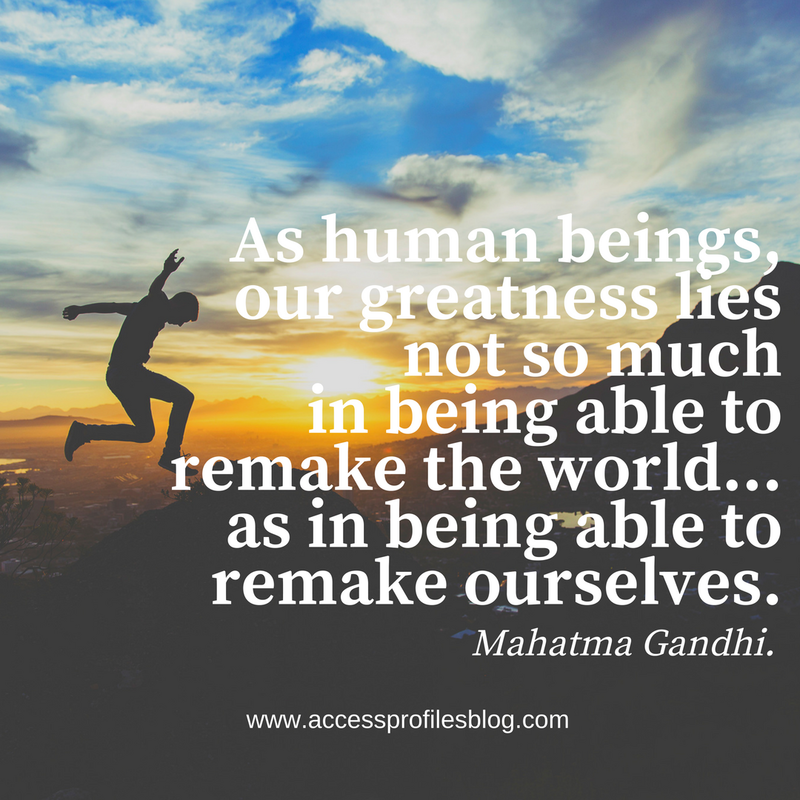 Read more about how you can safely hire someone with a criminal past in, “Once a Criminal, Always a Criminal ~ Why We need to Believe in Second Chances”. That is why it is more important than ever that you consider going against your traditional hiring practices. Recognize that the information you discover during the background check is only part of the picture. People are much more. They are capable of change. They learn from their mistakes and experiences. They grow. This is where Individual Assessments come into play. Use this time to find out what circumstances may have contributed to their problems. Encourage them to be up front and open with you. Listen without judgment. Creating an atmosphere of trust is key. When it comes to a past criminal record, it is important that you uncover all the facts. You need to know whether they were arrested or actually convicted, how long ago their crime occurred, and if there were any relevant mitigating circumstances. This makes sense. But, most importantly, learn what they have done since to help them change. 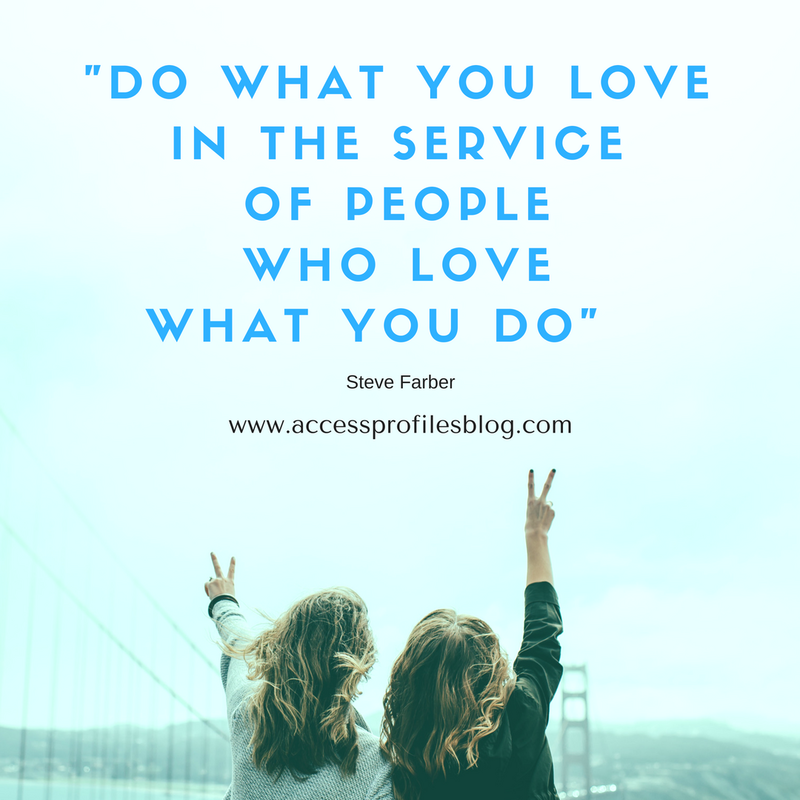 Discover more about how Individual Assessments can help you hire the right candidate for you in, “Individual Assessments ~ What They Are and Why You Need to Use Them in Your Small Business". It is human to make mistakes. It is what you do after that really defines you as a person. Anyone who is able to overcome a troubled past should, at the very least, not be automatically dismissed. Instead, give yourself a moment to pause and really look at the individual before you now. If you think they might be worth taking a chance, you could consider starting them out as a probationary employee. Hiring them on a temporary basis gives them an opportunity to prove themselves without you making a long-term commitment. It can give them the confidence and pride they need to firmly take their lives in a new direction. And the results may surprise you. Remember, people often rise to the occasion when given the chance! to give your traditional hiring practices a rest? Contact Us Now! API can help you hire safely and effectively in your Business! Find out more about everything Business ~ Subscribe Now! You will get one new blog article each week devoted to business tips and News. Learn more About Us and our Hiring, Business Mentoring, and Security Consulting services too! A Product or Service Small Business ~ Which Should You Choose? you want it to be? a Service or Product based small business! By far, this is one of the most important decisions you will make. Deciding on exactly what kind of business you want to start sets the tone for every other decision down the line. This focus is crucial in determining how your small business will be run, what customers you will target, and even what kind of start up money you need. When I first started, I knew I wanted to run a Background check company. And there was no doubt this fell squarely into the service business mold. 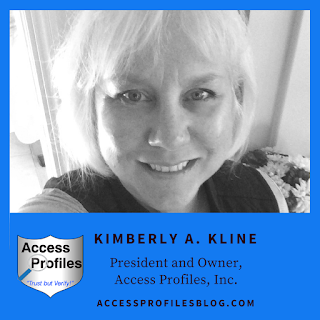 At the beginning, I focused solely on offering services that would help my clients hire safely and effectively. I helped them verify their applicant's past employment history and check courts for criminal records. Since then I have expanded my scope and added to that list, but the concept remains the same ~ I focus on helping my clients achieve their own small business success. I have found this to be especially fulfilling because it helps my clients and utilizes my skills and interests. The fact that I also find it personally gratifying makes it a complete “win~win”! That is what you should look for in your own small business. Find out what really speaks to you and makes the most of your talents. That is where you will find your best path to success. 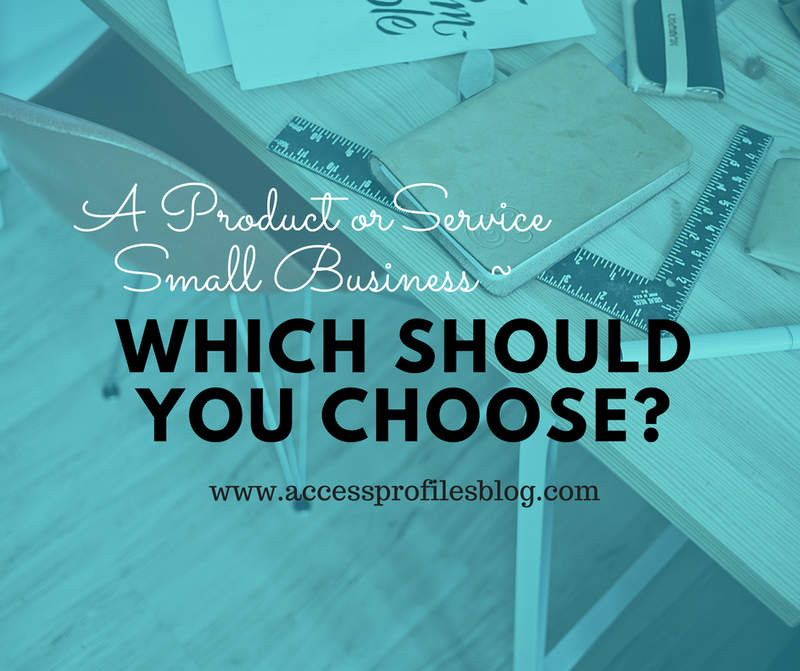 a Product or Service based Small Business? No matter which you choose, there are pros and cons to each. Providing a service allows you to easily draw on your own knowledge, skills, and interests. It becomes a business when you turn them into a marketable asset. For me, my background in professional writing has been especially helpful. It enables me to generate effective copy for my social sites, create forms specific to my needs, and write my small business blog ~ all without having to outsource any of these tasks. And these skills have ultimately brought me more recognition and real business. A business that provides services over one that sells products costs less, especially right out of the gate. I was able to get my background check business up and running with relatively little money. This is definitely helpful during the initial set-up phase. Most of us that start our own businesses are “cash poor”. Not having to invest a lot of our own money from the start is invaluable. Having a service business also enables me to continue with a low overhead. I do not have the inventory, production costs, and storage issues faced by a product based business. My utility costs are also minor in comparison. A service-based business is also easier to run out of your home. I needed very little space to set up a work station, and also a minimal amount of equipment. A computer (it was a desktop in the beginning! ), printer, dedicated phone and fax line, office supplies, and some filing cabinets, were all I needed ~ and I was in business! With a service business I never had to worry about storing my inventory, shipping supplies, or any of the other things it takes to make a product. Doing this would not be easy from home. Being able to easily work from anywhere at any time is one of my favorite things about having a home-based service business. I love that flexibility! Read more about running a business from home in my article, “The Challenges and Rewards of Running a Business from Home”! 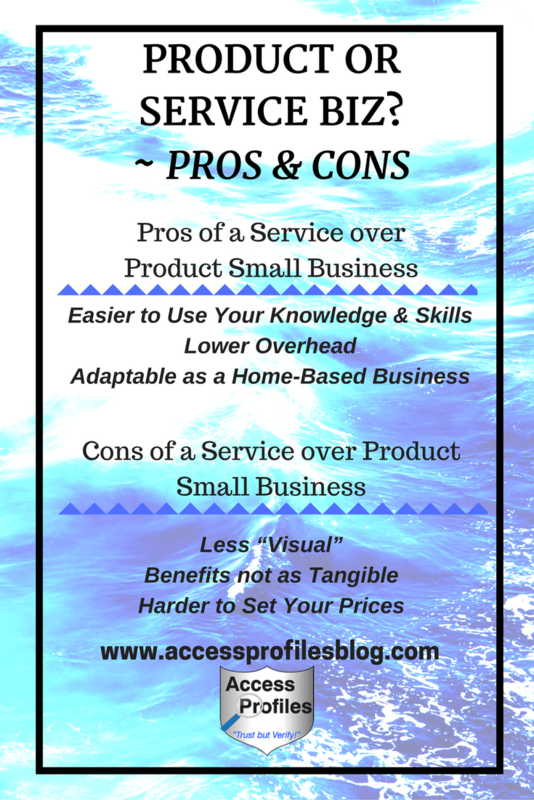 However, over time I have also found some “cons” in choosing a service-based business. Selling services instead of products is definitely less “visual”. That makes using social sites like Facebook, Pinterest, and Instagram much more challenging. Because of this, I have to be creative in finding ways to post to these sites. Generating my own blog title graphics and including relevant images in my posts has been crucial. By default, products are much more tangible than services ~ and that makes them much easier to sell. When you have a product, your customers can quickly grasp what you are offering and determine if it will benefit them. When you sell services, this is much harder to accomplish. You have to continually work at illustrating their value. Of course businesses that sell “things” also have to deal with proving their product’s worth, but it is still more concrete than the idea of a service. This has certainly been a challenge I continue to face when I selling my background check services - especially to small businesses. It is easier to justify the price of a product over that of a service. When setting your product prices, you can easily take into consideration production costs like materials and labor. Pricing services is much more elusive. I must determine the costs of my services on much less tangible factors. I set my prices based on things like my expertise, knowledge, and time. When meeting with clients, this is much harder to convey. I have often second-guessed myself over the years because of this. I have finally come to realize that I when I place more value in what I have to offer, so do my clients. Remember, the more you believe in what you are selling, the easier it is to charge what it is worth. Read more in “Find it Difficult Setting Your Prices? You are not Alone!”. Despite these obstacles, I don’t regret choosing a “service” business. I have found both enjoyment in discovering ways to help my customers solve their problems and fulfillment in knowing I have truly helped them succeed. and, luckily, so do my clients! If you are ready to start your own small business, Contact Me Now! and help you along the way. about running your own Small Business? Visit my Resources and FAQ page. About Me and My Services too! 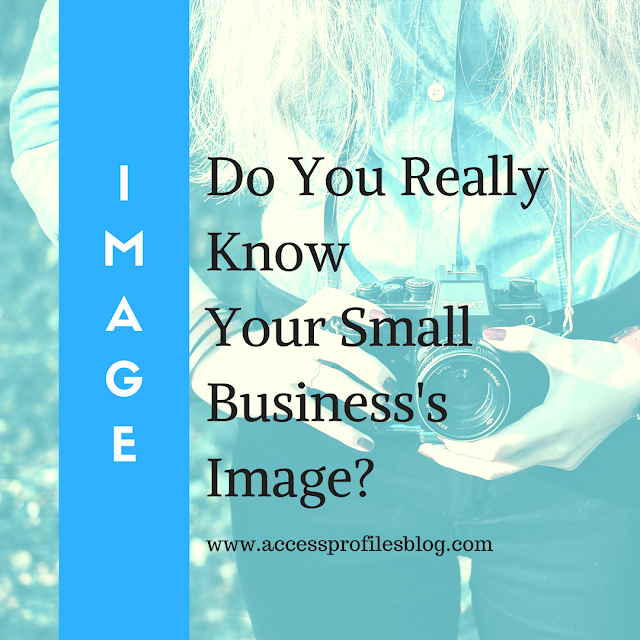 Do You Really Know Your Small Business’s Image? When you have a Small Business, image and brand mean everything. A positive image will help you draw in the much desired “new” customer. It will also help you keep your existing ones. That is why it is important to build the most positive image you can…and also so crucial to protect it! And the best way to do that is to really know what is “out there” about your Small Business! Have you checked your online reviews? Do you know the impression visitors get from your social media sites? How about your Better Business Bureau rating? Or how your company would fare during a civil court record check? Other companies are always vying for the business you want. Knowing what image your company is really portraying both online and off is critical to landing those customers and to your ultimate success. You need to realize that anyone thinking of hiring you or using your services will look. They will “google” your business. They will check your social sites. They may even check with the BBB. This is especially true if they are thinking of hiring you to work in their home. Babysitters and nannies, home health care providers, and even home contractors will be scrutinized. Many are increasingly using background checks to feel safer about hiring these types of companies. You can find out more about this in “The Top 6 People You Should Run a Background Check On!”. But even if your company is not on this list, it is still likely that anyone thinking of doing business with you will check. It is only natural. That is why you need to know all you can about how your company will fare if you go under the microscope. Taking these 3 steps will help! 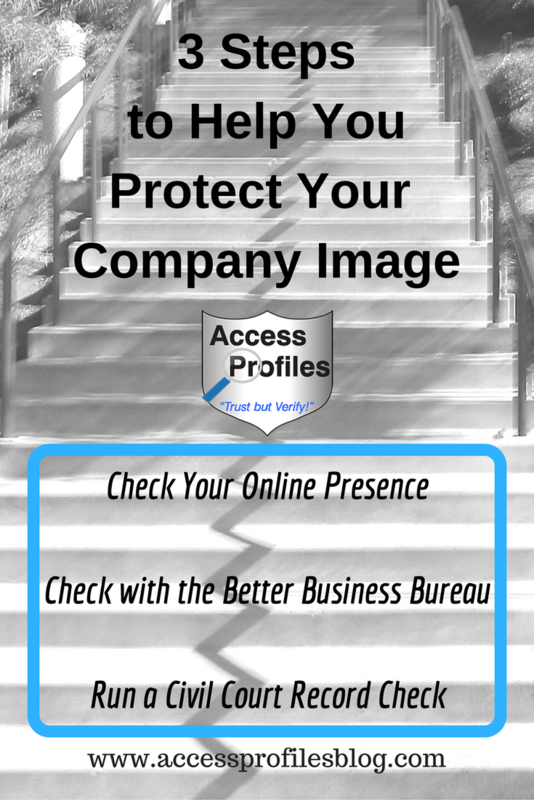 3 Steps to Take Now to Protect Your Small Biz Image! “Tweet This"
This should be your first and most important step. Start with taking a look at your social sites. Be sure to include Facebook, Twitter, LinkedIn, or anywhere else you have a profile. Do your sites look professional? Are they up to date? Do they all look cohesive and represent your brand? If you find any errors during this search, fix them. Make sure that everything listed is correct and all your links work. Presenting a unified online “front” is a great way to convey your company’s image and brand. Next you should search for any online comments and reviews mentioning your small business. This includes any posts made on your social sites. Word of caution, while it may be tempting, blocking comments or reviews on your sites is never good business. The whole idea of social is to be “social”. Establishing a positive give and take connection with your customers, and potential customers, is key. Now is the time to look at how you respond to these comments and reviews. Do you do it in a timely fashion? Are you professional and courteous, especially if the comment is negative? Do you make any necessary changes or address concerns with action? Acting fast, and apologizing if necessary, is good for your brand and your business! If you have a blog, then you should take a look at this also. Do you add to it regularly? Is it relevant? Does it add to and complement your other social sites? You should also make sure that you allow and respond to comments here too. Blogging is a fantastic way to build your brand and image. It gives your existing and potential customers a chance to know more about you and your mission. Learn more about the benefits to your brand of having a small business blog in “Have You ever Considered Starting a Blog? If Not, You Should!”. It is easy for anyone thinking of doing business with your company to do a quick search on the BBB site. Simply by typing in your company name, they can see your listed contact information, your rating (from A+ to F), and a customer complaint and review summary. It will also show any Government Actions that may have been taken against your business and an Advertising Review. This review shows any complaints or conflicts with the BBB’s policy of “truth in advertising”. If you don’t have a BBB profile, establish one. If you do, make sure that it reflects the most current and complete information for your business. Any thing that is outdated, incorrect, or no longer relevant should be changed. It is obvious, or at least it should be, whether your company has ever been sued or if you have sued others. So, if you have, this step should not be ignored. Knowing exactly what the records say is your goal. Many civil court records are online. Do a simple search and pull up any reports that mention you or your company. Read through them and pay special attention to cause of action and judgments. There will nothing you can do to change these court reports if they are correct. However, if there are errors, or the records do not pertain to you or your company, then you need to take action. If you find mistakes, your only real recourse is to contact the court(s) involved and request the errors be corrected. You will then need to follow up and make sure the necessary changes have been made. Following these steps is not a “one and done”. You need to make this a part of your regularly scheduled brand maintenance. Your goal should be to protect the image you have worked hard to build ~ and correct anything that is contrary to that goal. While it is certainly possible for you to do the work and “screen” your company yourself, hiring an impartial 3rd party makes sense. A professional background check company will be able to look at anything discovered with a fresh eye. They will have no vested interest in the social sites you have developed and post to every day or in the outcome of a company search. They will also know what information your customers will see as a “red flag”. But, most importantly, a good background check company will do more than help you identify what you can change, they will help you fix them! Hiring a background check company that will work WITH you and not just FOR you is key. Find out more in “5 Tips to Help You Choose the Best Background Check Company for You”! Savvy consumers recognize the importance of knowing everything they can about those they do business with. They will choose a company that has an active online presence, good reviews, and a history of strong customer service. Do you have questions or want to know how your company will fare during a background check? About Me and Services pages. You can become burnt out, complacent, or get in a rut. But that is not good for you or your company. In order to really succeed and grow, we need to embrace change and innovation. We need to revitalize our Small Business! And do you know the quickest and easiest way to do it? 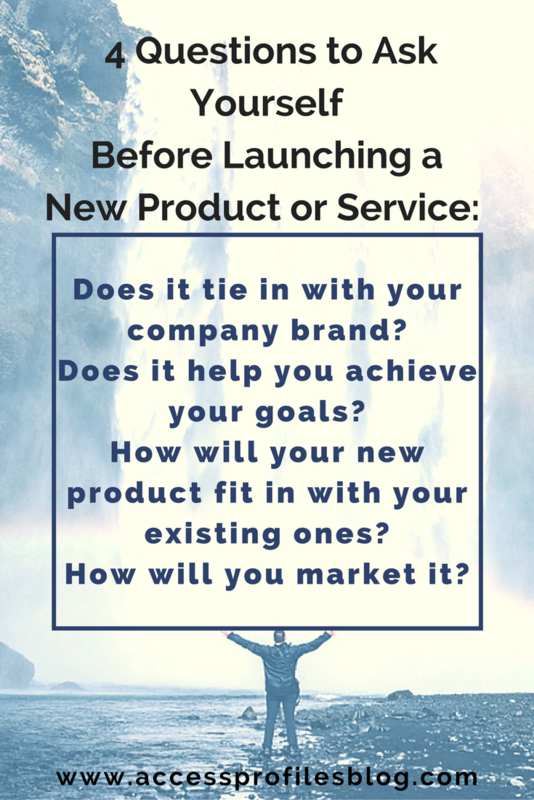 Launch a new product or service! Adding a new product or service to your small business is a great way to propel your company in the right direction. When done right, it can bring a new interest and energy to your entire company. Even the best small businesses can get stagnant ~ and that is increasingly true the longer you have been in business. Staunchly holding on to only what you have done in the past does a disservice to you and your clients. Infusing your business with new and innovative ideas keeps you moving forward. Many businesses go through periods when their sales are slow. Adding something new can help infuse your company with a new source of cash. Even business owners can get bored or complacent. Developing a new product or service can be just the thing to get your mojo going like it did when you first started. Brainstorming sessions and the excitement of the launch may be just what you need. The best products or services stem from solving your clients’ problems. Tap into the good relationship you have with your existing customers to find out what they need ~ and then figure out what you can do to help. The answer can lead to the perfect new product or service for your company! Chances are that there are others out there who have the same problems and needs as your current clients. Offering a new product that solves that problem will attract those potential new customers. These customers may not have even known about your company before, but now you will be on their radar. and get your product on the market. But this is when you need to put on the brakes ~ at least for a little while! Take time to do some research and reflection before you go public. Does it tie in with your company brand? How will your new product fit in with your existing ones? How will you market this new product? Remember, your company brand is important. It takes time to build trust in the products and services you provide. But very little time to lose it. That is why making sure that your new product closely matches the brand and goals you have established is vital. Now is not the time to offer something that is contrary to that image. Fit should also be considered. Is this new service compatible or complementary to what you now offer? You may even consider dropping one or more of your current products that are no longer performing or relevant. Instead of starting from scratch, another option is to revamp one of your existing products or services. The key is to keep in mind current need. Sometimes all it takes to generate new interest is to tweak what you already offer. Marketing this new product should also be addressed. You will obviously want to inform your existing customers of your new addition. Giving them a sneak preview and even a special “before official launch” deal is a great way to start. But you will also have to consider how to garner the interest of new clients. Preparing eye catching and informative posts for your social sites will surely be part of your strategy. If you have a blog, then you will also want to create at least one article focused on your new product. This is the perfect opportunity to go into more depth and really share the problem or need your product addresses. help you keep your passion and focus fresh ~ and it is also a great way to help your clients solve their biggest problems! To learn more about how blogging can help your small business, check out “Are You Afraid of Starting Your Small Business Blog? I can Help!”. is it finally the right time to launch! 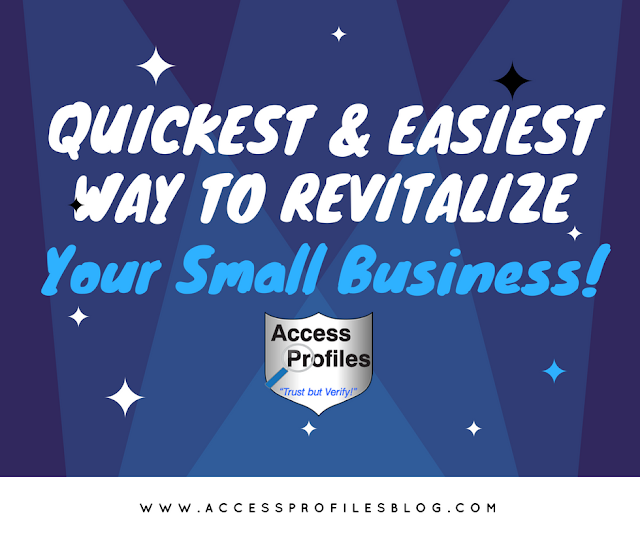 You will now have taken the quickest and easiest step to help revitalize your small business! Good Luck! Interested in help with your blogging efforts? Contact API Now! or even guide you in getting started from scratch. Thanks! please Subscribe Now to our blog. geared towards you and your Small Business! And no wonder! Looking for a job is a nerve wracking and anxious time ~ and the thought of an employer scrutinizing you and your past just adds to the stress. Even if you have nothing to hide, you can feel anxiety about the whole background check process. You might spend time wondering “What is an employer looking for?” and “What will they discover?”. Many job seekers have the same questions when it comes to employment screening. By focusing on 5 of those most frequently asked, I hope to provide the answers you need and help alleviate some of the stress that can drive you crazy while you search for your dream job. How far back do employment background checks go? It is standard for most employers to go back 7 - 10 years when it comes to background checks. This time frame is recommended by FCRA (Fair Credit Reporting Administration) and EEOC (Equal Employment Opportunity Commission) guidelines. Compliant employers and background check companies will follow this time frame. This can vary depending on the industry. Some companies, by law, are required to search for your entire past criminal and work history. Examples of this are jobs in finance, working with children, the elderly, or disabled, and in the transportation industry. While these guidelines do dictate how far back to go in searching for your criminal offenses, there are none when it comes to past employments, education, etc. An employer is free to go back as far as they deem necessary. This depends upon the scope of the background check requested. Many times the extent of the screening depends upon the position being filled. For example, an entry level job usually requires a more basic background check than one for a management or supervisory position. However, when most job seekers ask this question, they are really thinking about the criminal check. The 7 -10 year rule applies here too (with the exception of the regulated industries). This means that criminal offenses beyond that parameter are not supposed to be considered ~ whether they “show up” or not. If the background check is done internally, HR should follow this guideline. If it is outsourced to a reputable screening company, then only those offenses that fall within the time parameters should be reported. Court records are most often checked at the county and state level. Federal court records may also be requested. During a criminal check, cases will be found that resulted in both findings of not guilty and those where you were convicted. Even cases that were dismissed or are currently active (with no disposition) are uncovered. Traffic cases are rarely considered (unless a company car or driving is part of the job description). Education ~ dates of graduation and degree earned are most common. Class rank or GPA (QPA) are not usually requested. Employments ~ dates (start to end) and title of your most recent position are checked. Your reason for leaving is also commonly asked. When it comes to wondering what will “show up” during the background check, there are steps you can take to help alleviate your concerns. Making sure your resume is “background check ready” is a great way to start. Verifying that all the information listed is true and accurate is key. Discover tips on how to get your resume background check proof here! 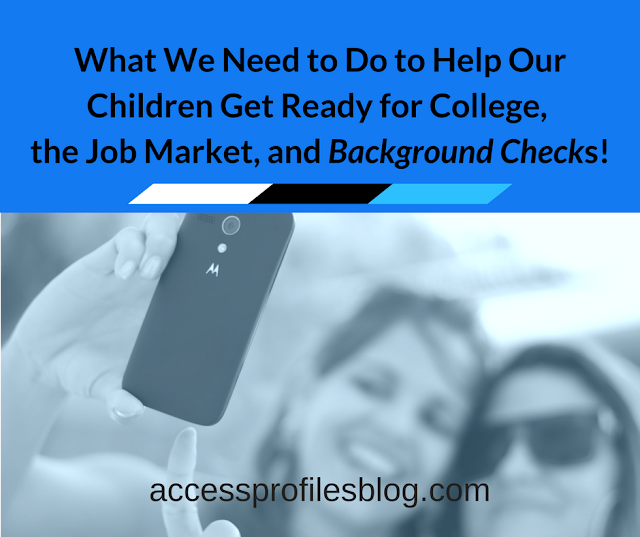 Getting a background check on yourself before you even apply for a job is also a smart move. Knowing in advance that nothing will be uncovered that could keep you from getting the job simply makes sense. 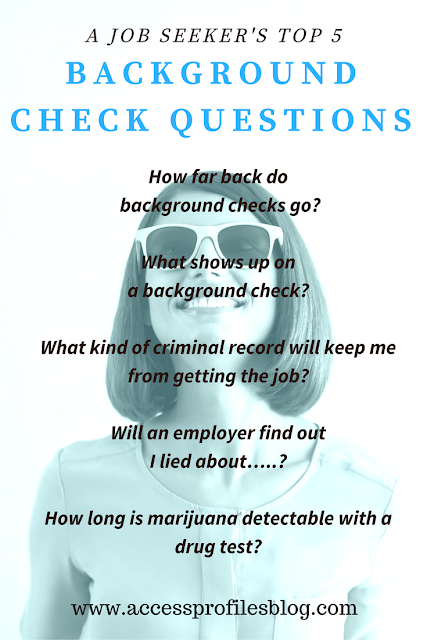 Find out more in “Why You Should Run a Background Check on Yourself”! What kind of Criminal Record will keep me from getting the job? No matter what kind of criminal history information may be uncovered during the background check, EEOC guidelines require most employers to only consider convictions when making their employment decision. For many employers, felony convictions are automatic red flags. Also of concern is any past criminal activity that may jeopardize the safety of their customers, employees, and their assets. Convictions for violent offenses are especially problematic. But, depending on the job, guilty verdicts for crimes like embezzlement, drug trafficking, or theft may also effect whether you get the job. Even if a record is found, you have rights.There are definitive steps that an employer must take if they are considering not hiring you because of your criminal history. 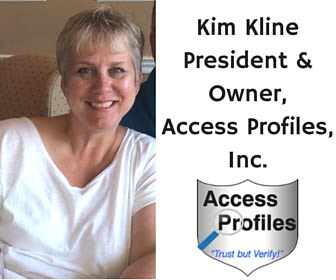 These include notifying you (in writing) if adverse information was found in your background check and giving you the chance to deny or mitigate those findings. Learn more about your rights here! It is important to note that not all employers will automatically eliminate you from consideration if you have a criminal record. EEOC guidelines actually recommend that employers only take into account offenses that directly pertain to the job. But if you do have a criminal past, your best defense is to be ready to plead your case. Own your criminal past, share any circumstances that lead to your conviction, and show what you have done since then to turn your life around. Will an employer find out I lied about….. Whether you have lied about your education, past employments, or anything else listed on your resume, the answer is YES!!!! More and more employers are doing employment background checks. And be assured, these screeners know what they are doing. Your lies will be found out. When that happens, you lose. According to employers, resume lies can cost you the job! Even if the employer initially decides to hire you anyway, there will always be the lingering question about your honesty. This can effect future promotions or raises. Read more about what happens when your resume lies are discovered in “Employers Share ~ Lie on Your Resume and You Lose!”. How long is Marijuana detectable with a drug test? With an increasing number of states legalizing the use of medical marijuana, and some extending that to recreational use, job seekers are justifiably interested in how that will translate to drug tests and employment. It is important to know that employers still have the right to require a “drug free” workplace. This includes using drug tests to deny employment or fire anyone that is impaired. To that end, many employers require pre-employment drug tests. And many others also practice random drug tests of current employees. The length of time that marijuana will stay in your system can vary. It depends on the kind of test used, how long since you last used, how often you use, and your own body. Another available test, the Saliva test, is not yet widely used. However, it is able to detect current use, even if you have only used marijuana for a day or two. Marijuana use becomes slightly more problematic when approved for medical use. Employers cannot discriminate against employees who test positive for marijuana when it’s prescribed by a physician. However, employers in many states are still allowed to reprimand employees who are impaired on the job, even if it is due to medically prescribed marijuana. It is also important to remember that marijuana use is still illegal under federal law. Any employer that receives federal funding, or is subject to federal regulations, is required to consider marijuana a prohibited substance. Find out more about Marijuana and the Workplace in “Marijuana, Employers, and Drug Testing ~ What You Need to Know”. 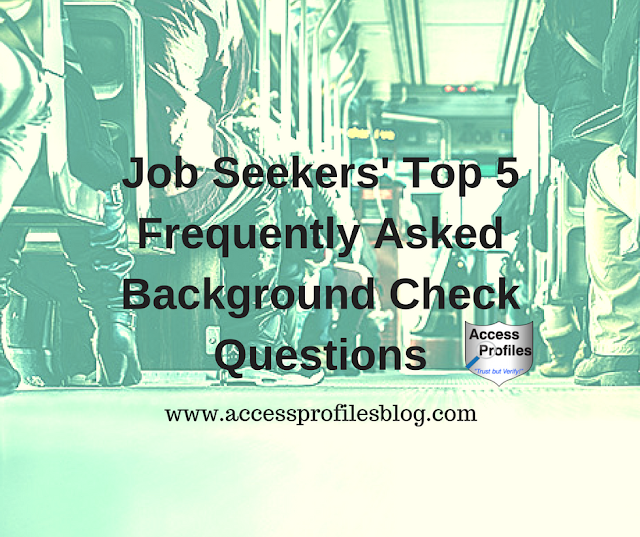 Knowing what questions job seekers have about background checks is valuable for employers too. It gives them the opportunity to put their applicants at ease and make the hiring process much less stressful. It also allows an employer to establish an open and honest channel of communication with their potential new hires from the start. Learn more in “Ready to Hire? What Your Applicant Needs to Know”! Contact Us Now! API can help! Please Pay it Forward and share this article on your favorite social sites. Thanks! the hiring and background check process. And find out more About Us and our Background Investigation, Business Mentoring, and Security Consulting services too!